In the Apostle Paul’s last letter before death, he gave Timothy some signs of the last days. Do you know someone who once claimed to be a Christian but then later walked away from the faith? This is not a surprise to God. Perhaps it was to us, but it may be that they were never really converted in the first place and came to Christ for the wrong reasons (happiness, prosperity, and good health). The Apostle John wrote, “They went out from us, but they were not of us; for if they had been of us, they would have continued with us. But they went out, that it might become plain that they all are not of us” (1st John 2:19), so they may have never really been saved in the first place, or they would have remained with the church. God alone knows (1st Sam 16:7). The Apostle Paul wrote, “Now the Spirit expressly says that in later times some will depart from the faith by devoting themselves to deceitful spirits and teachings of demons” (1st Tim 4:1), and all you have to do today is look around you and you can hear all of the various teachings, many of which are clearly not from God, so there is no shortage of false teachers today, but you can’t judge them by their looks. They might appear to be godly, be an eloquent speaker, and have a charismatic personality, but the Bible says that even Satan’s ministers can appear as angels of light, so they might look good, they might even sound good and have a huge following, but the benchmark for truth is not in looks or how it sounds or by how many there are. It must be biblical preaching, which is mostly expository verse by verse preaching, which includes repentance, faith, Jesus’ sinless-ness and His divinity, living in holiness (not perfection), sanctification, and glorifying God. Any preaching that does not cover at least some of these things is not biblical preaching at all; it is tickling the ears to satisfy the listeners, for as Paul wrote, “the time is coming when people will not endure sound teaching, but having itching ears they will accumulate for themselves teachers to suit their own passions, and will turn away from listening to the truth and wander off into myths” (2nd Tim 4:3-4). Staying in the Word of God will help keep you out of doctrinal error and false teachings … you’ll discern when something’s not quite right. Before conversion, most every believer was living a life that was all about them (me included), but after we are changed into a new creation in Christ (2nd Cor 5:17), our hearts are bent toward serving God and serving one another. That’s not natural. What is natural is that “people will be lovers of self, lovers of money, proud, arrogant, abusive, disobedient to their parents, ungrateful, unholy” (2nd Tim 3:2). This is why Paul writes “that in the last days there will come times of difficulty” (2nd Tim 3:1). We, as humans, have become more like toddlers in their “terrible twos,” and “We want it, and we want it now,” or a riot might break out like it did in an airport when an airline canceled all their flights (through no fault of their own). Paul warns that “people will be lovers of self, lovers of money, proud, arrogant, abusive, disobedient to their parents, ungrateful, unholy” (2nd Tim 3:2). Get in anyone’s way and you’ll pay for it. If a guy passes me and cuts me off, I just slow down, but if I try that in rush hour traffic, there is a risk for road rage. If a driver pulls in front of another, trying to eventually turn to a right exit ramp, people get beside themselves and take it as an act of aggression, where recently, a man in our city turned it into revenge, and today, there seems to be less regard for life. People love themselves and they love their money, and anyone that tries to get in the way is going to get hurt. Today, our society is increasingly “proud, arrogant, abusive, disobedient to parents, ungrateful [and] unholy.” Could anyone argue with that? Today we are more and more like a hedonistic society, or “eat, drink, and be merry, for tomorrow we die.” That’s a tendency that Paul said would be coming in the later days, as people would grow “heartless, unappeasable, slanderous, without self-control, brutal, not loving good” (2nd Tim 3:3). Whatever pleases the flesh must be good, so if we can’t live in it, drive it, hold it, drink it, eat it, or smell it, we don’t seek it. It’s not so much, “What have you done for me lately,” but “What will you do for me now.” I speak of myself too because my heart’s deceitful (Jer 17:9), but an unconverted heart is so wicked (like mine was and still is to an extent), it cannot choose what is good, and so what is good becomes evil, and what is evil becomes good. Isaiah the Prophet wrote about this very same thing, and even though it was written to Israel, it applies to all of mankind. He wrote, “Woe to those who call evil good and good evil, who put darkness for light and light for darkness, who put bitter for sweet and sweet for bitter” (Isaiah 5:20). Those who see good as evil will tend to be more heartless, unappeasable (simply can’t please them! ), slanderous, without self-control, brutal, [and] not loving good. Name a new video game or movie that doesn’t have at least some of these elements (if not all). The escalating violence in the many different media forms has desensitized our society to graphic violence. We don’t even blush anymore. These days seem very similar to the days of Noah which Jesus warned about in the last days, and said, “For as were the days of Noah, so will be the coming of the Son of Man” (Matt 24:37), as “they were unaware until the flood came and swept them all away, so will be the coming of the Son of Man” (Matt 24:39). We must keep on guard because today, many so-called preachers and teachers are “having the appearance of godliness, but denying its power. Avoid such people” (2nd Tim 3:5), so the Apostle Paul’s advice is to “continue in what you have learned and have firmly believed, knowing from whom you learned it and how from childhood you have been acquainted with the sacred writings, which are able to make you wise for salvation through faith in Christ Jesus” (2nd Tim 3:14-15). That’s because “All Scripture is breathed out by God and profitable for teaching, for reproof, for correction, and for training in righteousness, that the man of God may be complete, equipped for every good work” (2nd Tim 3:16-17). Staying in the Word of God will help keep you out of doctrinal error and false teachings because if you know the Word of God well enough, you’ll discern when something’s not quite right. 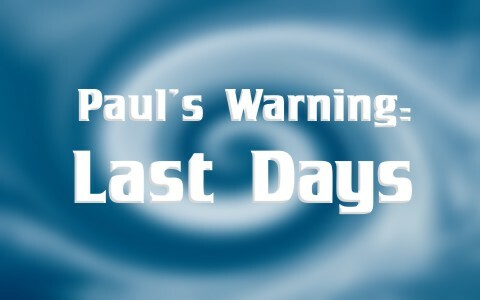 More on this topic: End Times: Are We in the Last Days? Previous post: What Do Dreams And Visions Mean Today? Next post: Do Apparitions Of Jesus And Mary Come From God?